Aquazzura's 'Rendez Vous' suede mules have been made in Italy and topped with a thick band of gold leather to keep your feet secure as well as balance the 105mm heel. 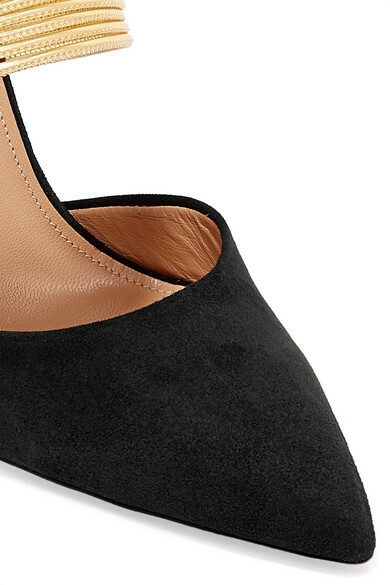 This pair is designed with a sleek pointed toe for a leg-lengthening effect. Wear yours with cropped hemlines to keep the metallic straps in focus. Shown here with: Roland Mouret Pants, Self-Portrait Top, Hillier Bartley Clutch, Sophie Buhai Earrings.